Region: The cricket is found throughout North America. Life cycle: This insect produces up to three generations each year. In southern regions, the insect overwinters in the nymph or adult stage, but everywhere else, it passes winter as an egg. Physical Description: This one-inch long insect is black or dark brown with long antennae and wings that are folded flat along its sides. The eggs are laid in moist soil. Feeding characteristics: This pest will attack bean, cucumber, melon, squash, tomato, and other vegetable plants by chewing the foliage and flowers of young crops. Controls: The damage is usually minimal and controls are rarely necessary. 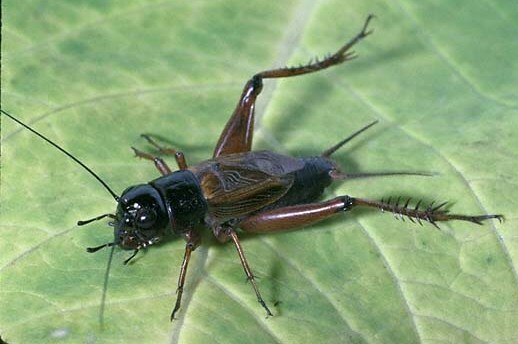 Crickets are the perfect food for toads in your organic garden.